Cambridge Wealth Management Should you convert to a Roth IRA? Investors at any level of income can convert assets from a traditional IRA to a Roth IRA. This article explains the potential benefits and tax implications of a conversion. Your willingness to pay the federal income tax bill that a conversion is likely to trigger. A larger sum to bequeath to heirs. Since lifetime RMDs are not required for Roth IRAs, investors who do not need to take withdrawals may leave the money invested as long as they choose which may result in a larger balance for heirs. Additional planning consideration – estate taxes: State estate taxes do not provide an IRD deduction (income in respect of decedent). Therefore, estate tax savings must be balanced against future income tax rates for you and your heirs. In short, estate tax benefits are greater at the state level, and only relevant at the Federal level for IRA-centric estates. Note: After an account owner's death, beneficiaries must take required minimum distributions, although different rules apply to spouses and non spouses. Taxes upon conversion. Investors who convert proceeds from a traditional IRA to a Roth IRA are required to pay income taxes at the time of conversion on investment earnings and any contributions that qualified for a tax deduction. If you have a nondeductible traditional IRA (i.e., your contributions did not qualify for a tax deduction because your income was not within the parameters established by the IRS), investment earnings will be taxed but the amount of your contributions will not. The conversion will not trigger the 10% additional tax for early withdrawals. A conversion may be more attractive the further you are from retirement. The longer your earnings can remain invested, the more time you have to help compensate for the associated tax bill. Pay the tax when your tax rate is anticipated to be the lowest. Tax equivalency principle: Your current and future tax brackets will affect which IRA is best for you. If you expect to be in a lower tax bracket during retirement, sticking with a traditional IRA could be the best option because your RMDs during retirement will be taxed at a correspondingly lower rate than amounts converted today. On the other hand, if you anticipate being in a higher tax bracket, the ability to take tax-free distributions from a Roth IRA could be an attractive benefit. There is no easy answer to the question "Should I convert my traditional IRA assets to a Roth IRA?" As with any major financial decision, careful consultation with your financial advisor and accountant is a good idea before you make your choice. 1. 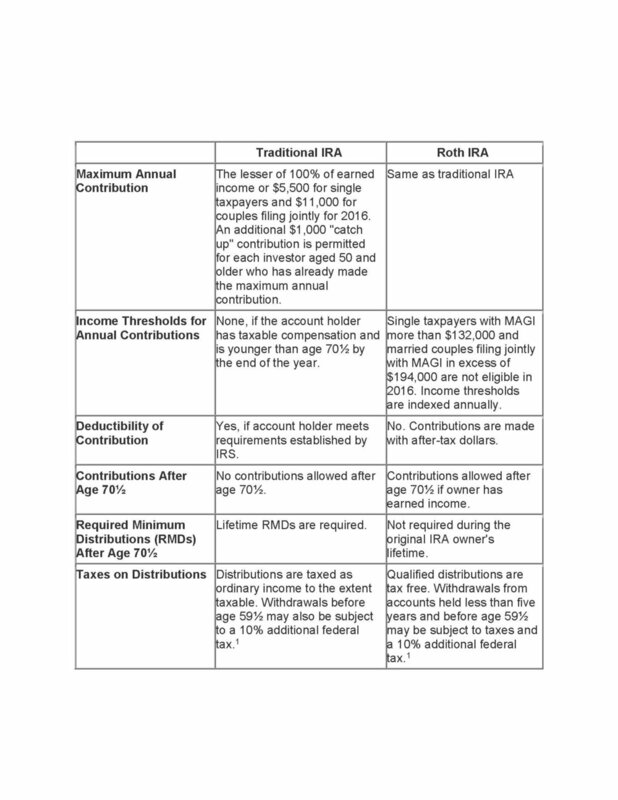 IRA account holders (both traditional and Roth) may avoid the 10% additional federal tax on withdrawals before age 59½ only if they meet specific criteria established by the IRS. See Publication 590-A for more information. Because of the possibility of human or mechanical error by Wealth Management Systems Inc. or its sources, neither Wealth Management Systems Inc. nor its sources guarantees the accuracy, adequacy, completeness or availability of any information and is not responsible for any errors or omissions or for the results obtained from the use of such information. In no event shall Wealth Management Systems Inc. be liable for any indirect, special or consequential damages in connection with subscriber's or others' use of the content. Cambridge Wealth Management rewrote parts of the introduction, closing paragraph, and added the section titled "Additional planning consideration – estate taxes," and the term "tax equivalency principle." © 2016 DST Systems, Inc. Reproduction in whole or in part prohibited, except by permission. All rights reserved. Not responsible for any errors or omissions. Investors should carefully consider their own investment objectives and never rely on any single chart, graph or marketing piece to make decisions. The information contained in this piece is intended for information only, is not a recommendation and should not be considered investment advice. Please contact your financial adviser with questions about your specific needs and circumstances. All data are driven from publicly available information and has not been independently verified by Cambridge Wealth Management, LLC. Certain statements contained within are forward-looking statements including, but not limited to, predictions or indications of future events, trends, plans or objectives. Undue reliance should not be placed on such statements because, by their nature, they are subject to known and unknown risks and uncertainties.